Are you ready for family fun in Waterloo Region and its vibrant winter events? Every year, our region plays host to so many exciting outdoor and indoor events that are sure to excite the whole family. Whether you’re looking for free events or are ok with spending a little cash, you’re in luck with lots of options to choose from. So gather your kiddies, snow pants and all, and head over to one of the following exciting community events hosted in our great region! Just two of our region’s wonderfully maintained outdoor skating rinks, the Waterloo Town Square and Carl Zehr square in Kitchener are both perfect places to enjoy an outdoor activity with fun for the whole family. We really enjoy the location of each as we can take our family for hot chocolate at one of the many café’s located in walkable distance to each rink. If your little one’s are too small to skate on their own, the rinks permit learning aids but be sure to bring them along yourself. Check out these or one of our region’s many skating rinks to give your family a winter glow. We have enjoyed each of these rinks as skaters as well as spectators. A wonderfully inclusive type of family entertainment. 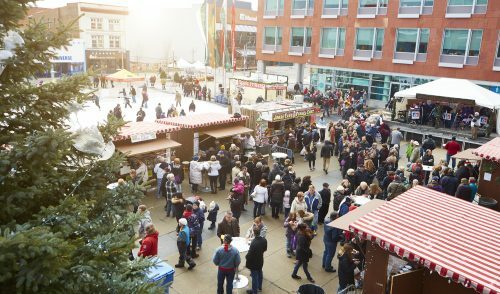 This German heritage Christmas market has been entertaining, inspiring and vending to families in Waterloo Region for 20 years! The market never ceases to amaze with beautiful hand-crafted treasures that you’re not going to find at any box store. Bring your kids out to be amazed at the wooden decorations & toys, the yarn or fabric crafts & clothing, candles, scents and other treasures. While you’re there, be sure to bring your appetite as the food vendors outside will warm you up from the inside out & it will be impossible to walk past all of the glorious smells without trying a tasty treat. Don’t forget to check out their website for a schedule of entertainment as Choirs, Bands, Folk Dancers and other entertainment are also on offer, free for your family’s enjoyment. Our family has been attending this event for the last few years and love the way the whole market evokes the holiday spirit early in December. Grab your thermos of tea or hot chocolate, wrap the kids up warm and bring the whole family to this beautiful lights show in Waterloo Park. With over 80 different lights displays, you can stroll along the park’s pathways and enjoy a holiday experience full of awe and beauty. A talented group of volunteers has been hard at work creating the spectacle you will see throughout the Wonders of Winter displays. If you’re in the mood for a horse-drawn trolley ride by St Jacobs Horse Drawn Tours, head over to the Park Inn on a Friday or Saturday nights (weather dependant) throughout December and also on Christmas Eve & New Year’s Eve. These rides are free but a donation box is also available. When our family attended this event in year’s past, we were so impressed with how the volunteers have really pulled such a beautiful scene together. This holiday themed event is perfect for the whole family, young and old, because you can all head out without the worry of anyone getting too cold. 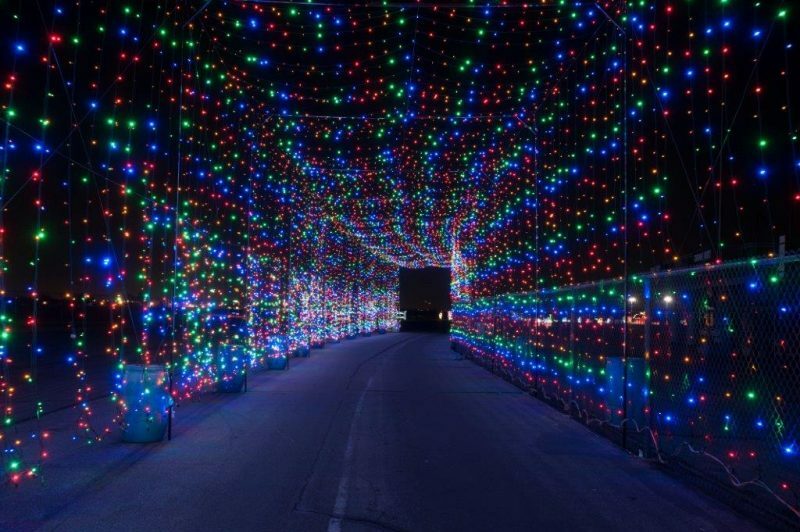 This 2 kilometre drive-through lights display is absolutely stunning, beginning with an array of holiday favourites like Santa, Frosty and adorable skating penguins, then building up excitement through to the completely fantastic light tunnel near the end. Upon arrival, be sure to set your car’s radio to the Bingeman’s Christmas radio station (you’ll be prompted by your greeter), to get your group fully into the Christmas spirit. Hot Chocolate or Cider is available for purchase and everyone can snuggle up while enjoying the lights outside of the car. This event is especially enticing as it’s accessible for any person able to ride in a vehicle. This is the first year for this event and our family attended the opening night. We weren’t sure what to expect but were awed after every turn with more and more to look at around each corner.